While tomorrow may be a day off from work, it’s a day filled with observation, commemoration, and gratitude for friends, family, and all who have served, are serving, or are yet to serve in our country’s armed forces. We are eternally grateful for your service and sacrifice every day, even if it’s just more acute on this day. 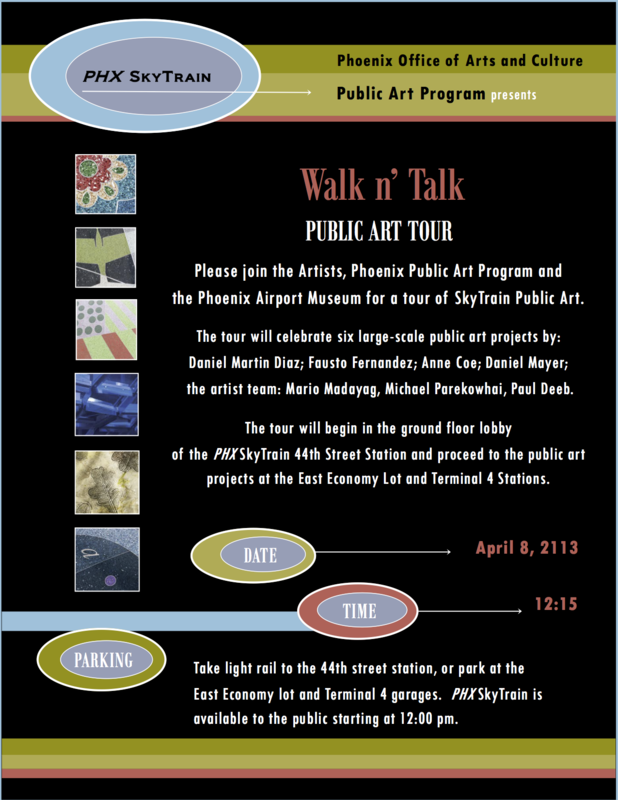 A picture of Her Secret is Patience, the public art piece in downtown Phoenix. 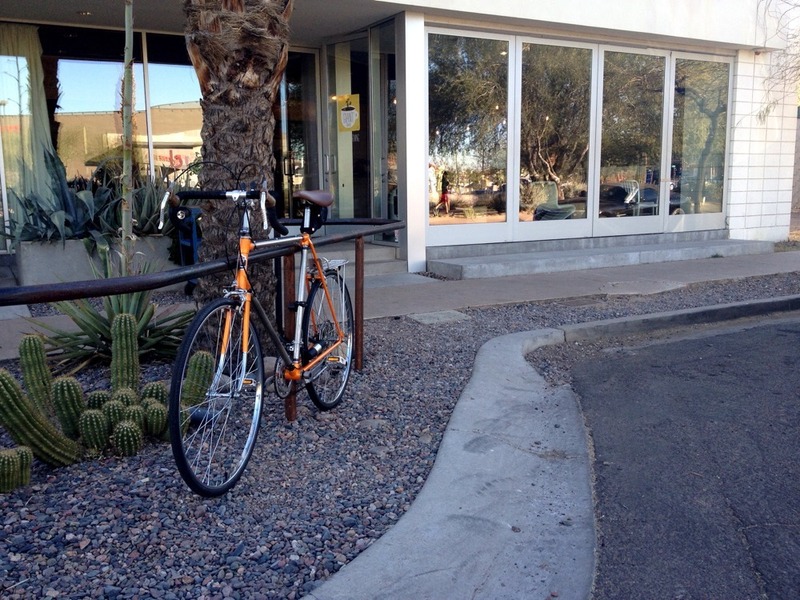 I think it goes without saying that my all-time favorite piece of public art hangs right here in downtown Phoenix. 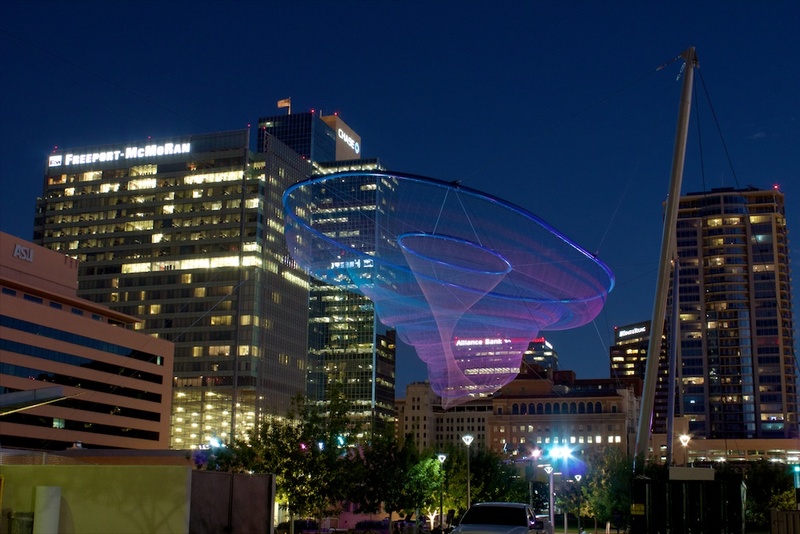 It’s Her Secret is Patience, created by the artist Janet Echelman, for the Downtown Phoenix Civic Space Park. It, like most things in downtown Phoenix, photographs better at night than during the day. What’s OUR Apollo moment today? What is our Apollo moment today? What can we accomplish before THIS decade is out? Forty-three years ago, humanity set its first feet on a foreign celestial body. 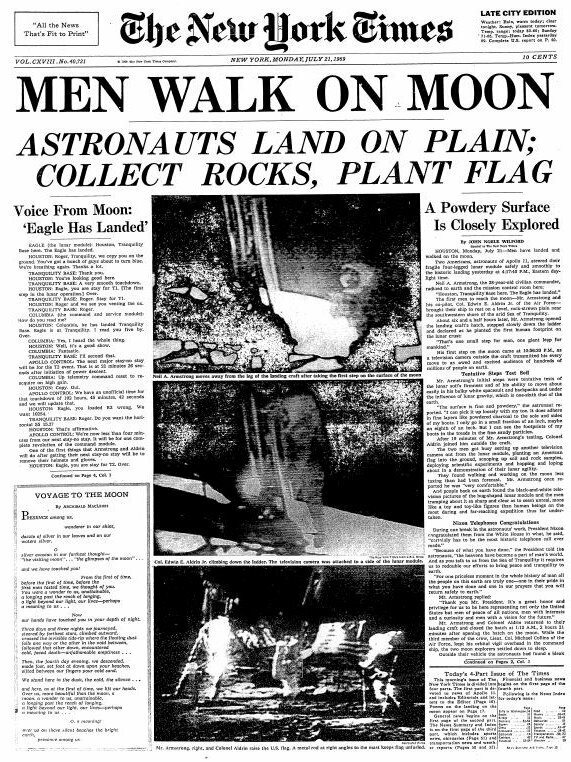 Or, in other words, 43 years ago, we landed on the Moon. What is our Apollo moment today? What one goal can we as Americans — nay, as humanity unified — achieve before this decade is out? Do we choose to eradicate poverty and hunger? Or pledge to ourselves that war will be no more? Do we challenge ourselves to stop our influence on global warming? If we don’t dream audaciously, then humanity’s future is bleak. Here’s to exploring further, digging deeper, and dreaming like we’ve never dreamed before. 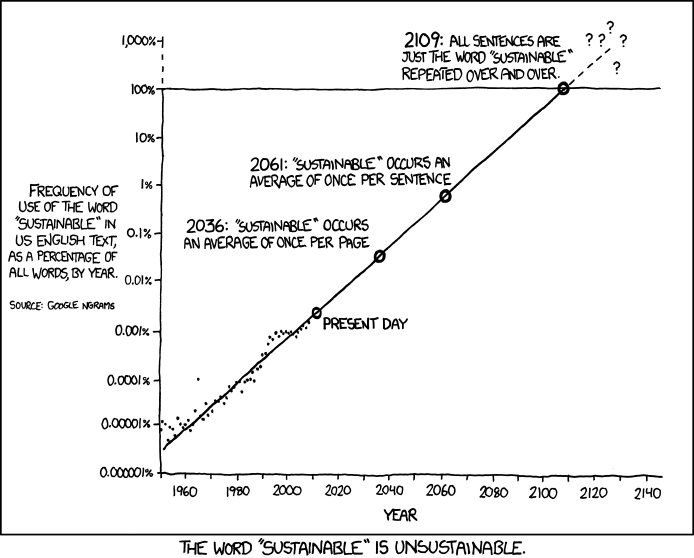 The webcomic xkcd has this interesting diagram showing that the word “sustainable” is unsustainable. For what it’s worth: the webcomic xkcd has created a diagram rendering the term “sustainable” as unsustainable. It’s an interesting chart but one that I’m sure merits little attention. Unfortunately, there’s a bill in the Arizona state legislature (SB 1507) that would make sustainability illegal in the state of Arizona, including its cities. My friend Stacey Champion has been leading the fight to stop this very bad bill from making its way through the Capitol. At her blog (phxosophical.blogspot.com; guidance: language), you can find information on this bill, including a petition signed by many of us to stop it. Downtown Phoenix still isn’t ready to take off. Parking lots for cars — the enemy of density — is still a priority. Grr. Keep in mind that this building at 2200 N Central Avenue is less than a block away from the Encanto / Heard Museum METRO light rail station. But no, we have to consider car parking. 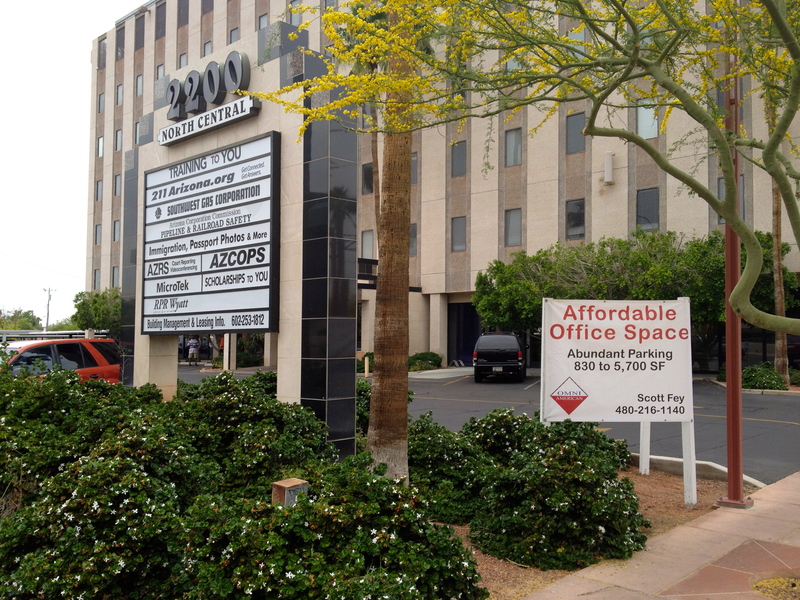 If we have to consider that “abundant parking” is a key feature for anything in central Phoenix, then what we have here is a failure to launch. 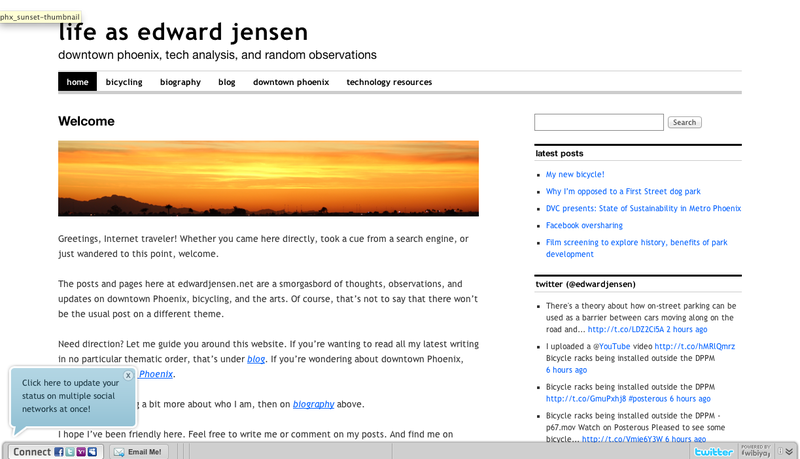 Author Edward JensenPosted on 13 April 2012 Format ImageCategories Downtown PhoenixTags Arizona State University, ASU Downtown Closed Campus, ASU Downtown Phoenix campus, Building Plaques Project, City of Phoenix, Doctrina Urbi Serviat5 Comments on Doctrina Urbi Serviat?